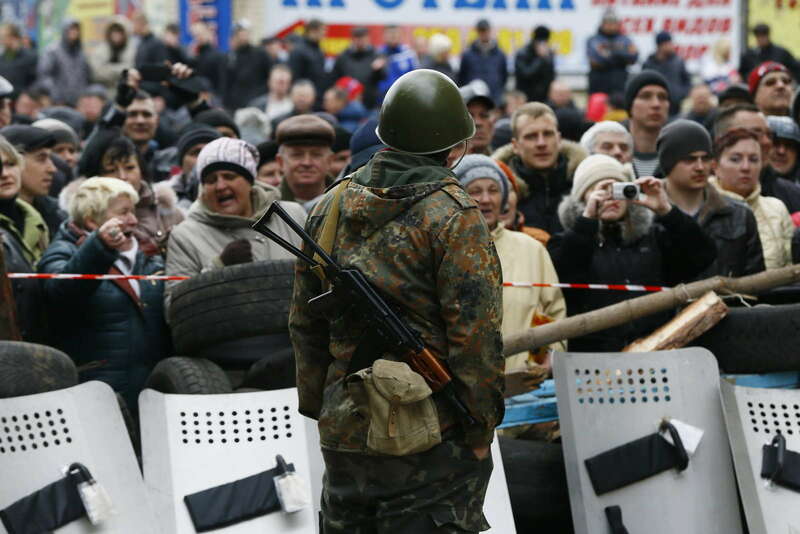 KRAMATORSK/SLAVIANSK, Ukraine - Ukrainian government forces and separatist pro-Russian militia staged rival shows of force in eastern Ukraine on Wednesday amid escalating rhetoric on the eve of crucial four-power talks in Geneva on the former Soviet country's future. 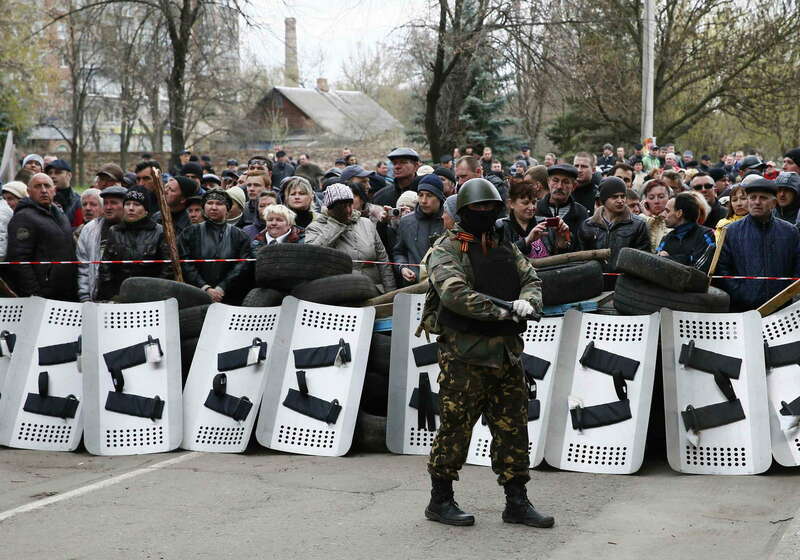 Government troops drove seven armored personnel carriers flying the Ukrainian flag into the town of Kramatorsk after securing control of a nearby airfield from the rebels on Tuesday, prompting Russian President Vladimir Putin to warn of the risk of civil war. 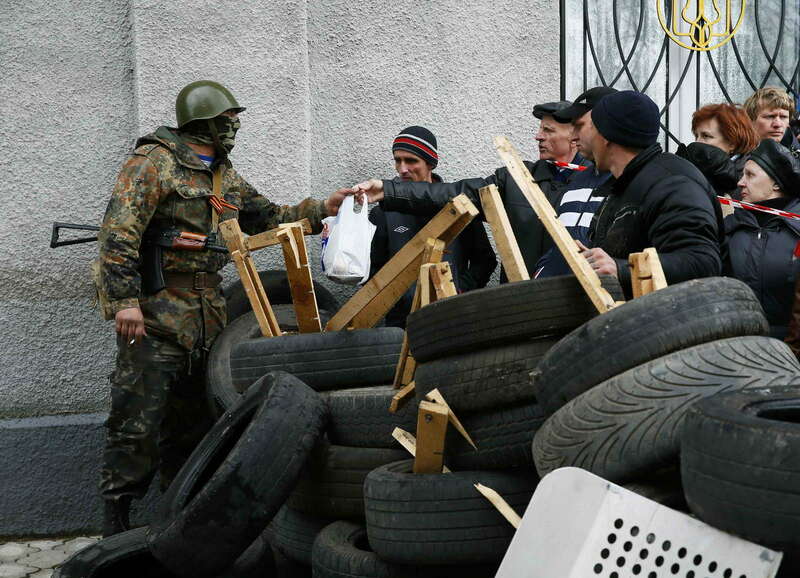 But just 15 km (9 miles) away, armed men in different types of combat fatigues drove six armored personnel carriers, one flying the Russian flag, into the town of Slaviansk, stopping outside the town hall, which is occupied by separatists. 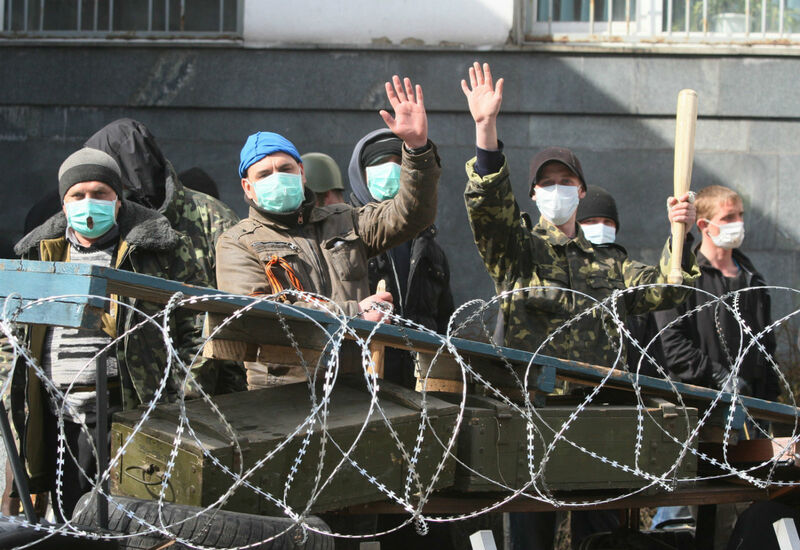 The armed men waved as they drove in, and some people waved back and shouted: "Well done lads!" 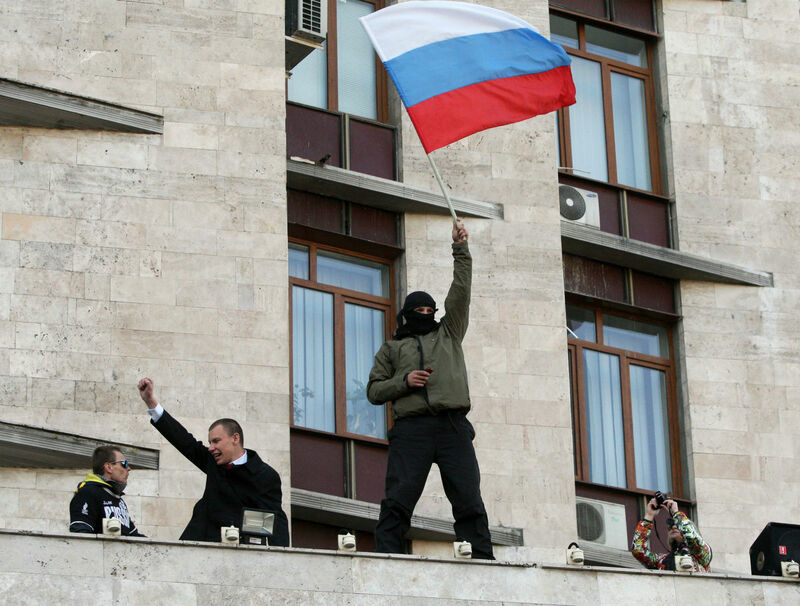 and "Russia" Russia!" 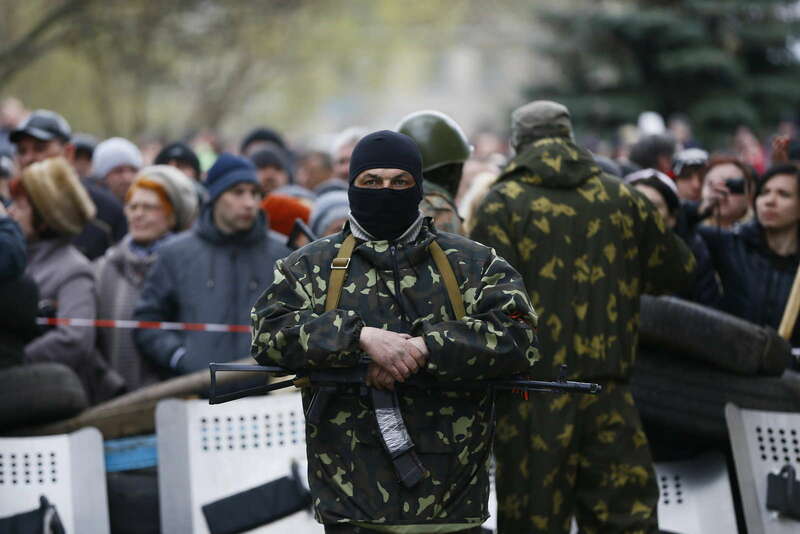 Overhead, a Ukrainian jet fighter carried out several minutes of aerobatics above the town's main square in a clear show of strength by Kiev's forces. 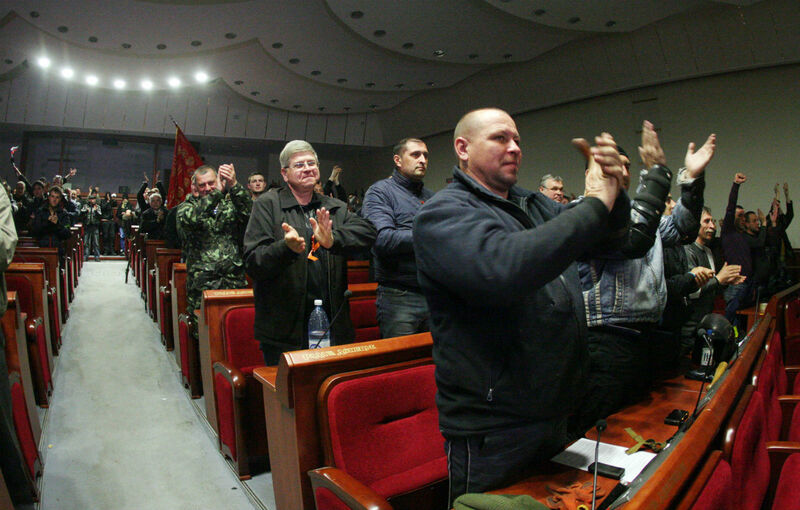 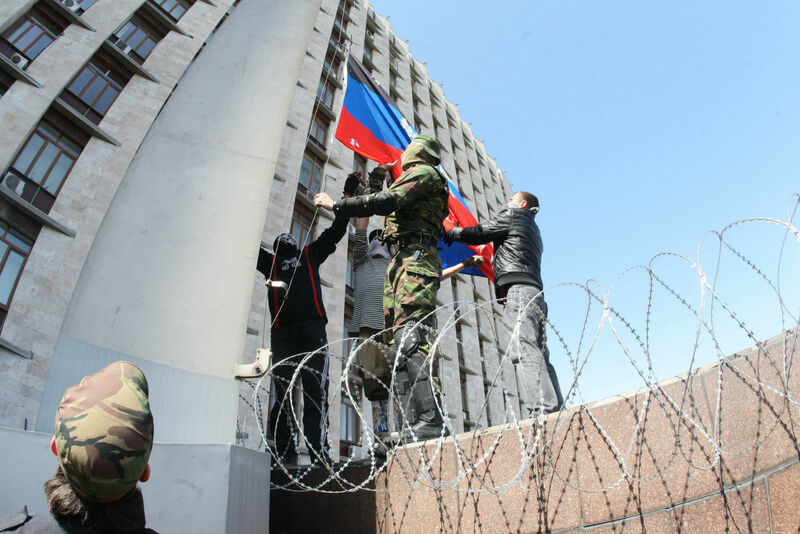 In the industrial city of Donetsk, at least 20 armed separatists occupied the city council building, a spokeswoman for the council said. 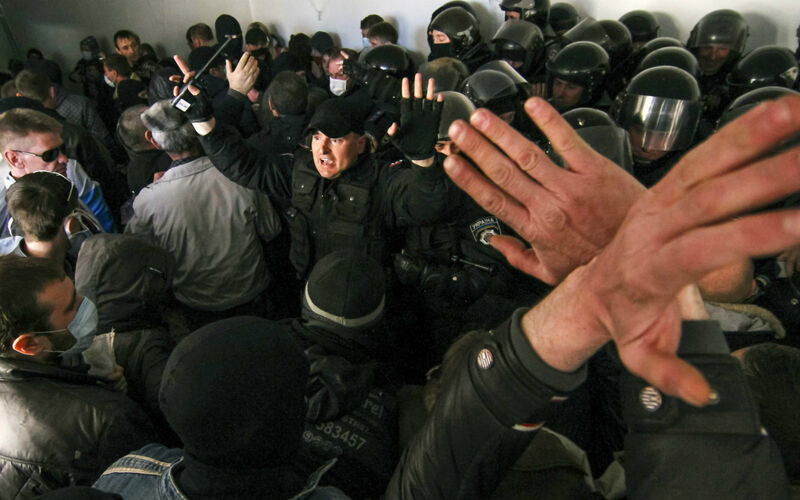 The muscle-flexing and inflamed rhetoric heightened fears of violence after Moscow-backed gunmen occupied public buildings in 10 eastern towns and cities in the last week. 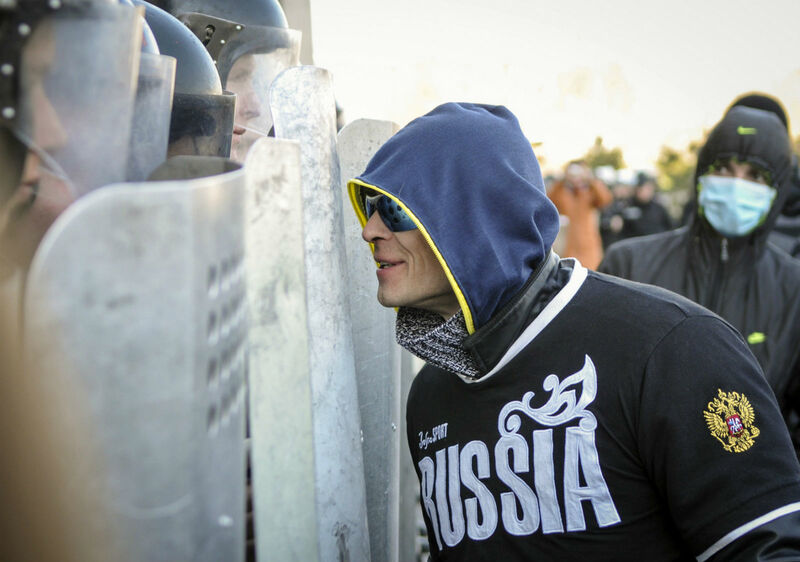 The Kiev government is seeking to reassert control slowly and without bloodshed before Thursday's Geneva meeting at which the Russian and Ukrainian foreign ministers are due to meet for the first time in the presence of the United States and the European Union. 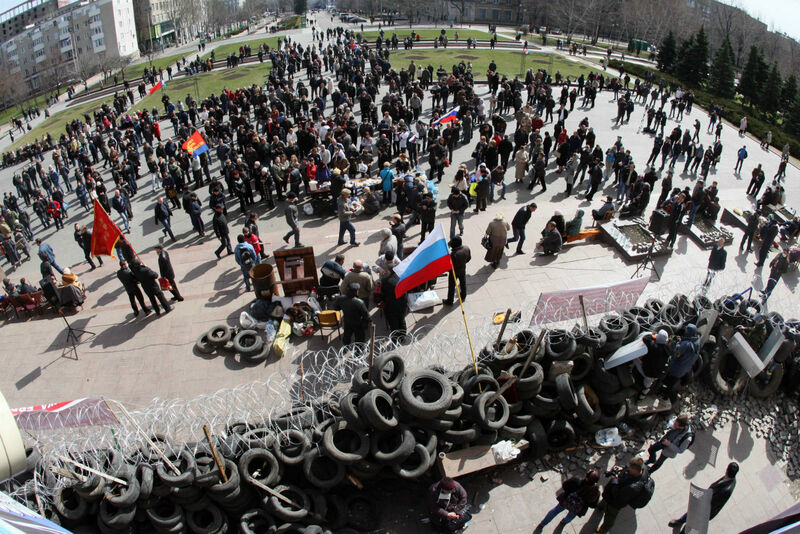 Russia, which has refused to recognise Ukraine's pro-Western government since Moscow-backed President Viktor Yanukovich was ousted by mass protests in February, sought to dramatize instability in its neighbour ahead of those talks. 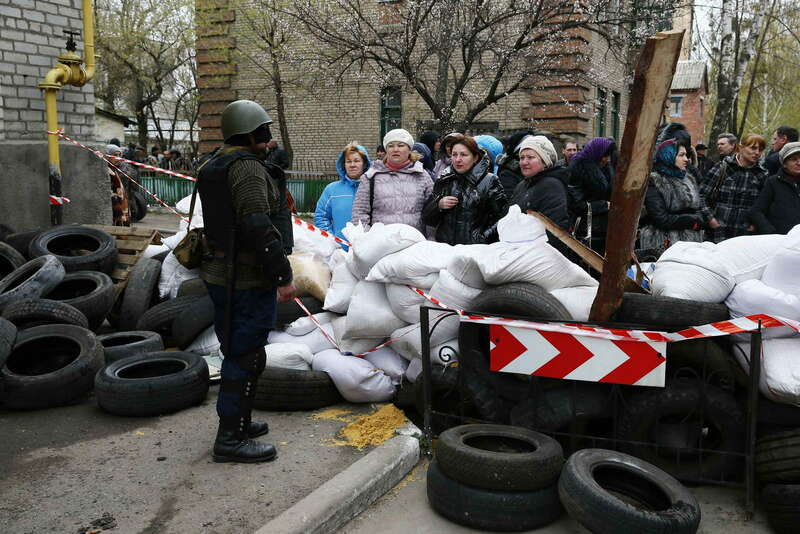 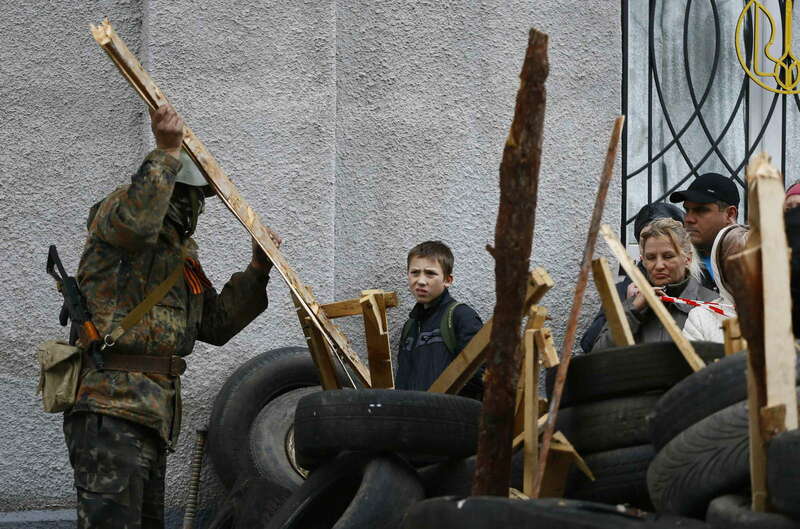 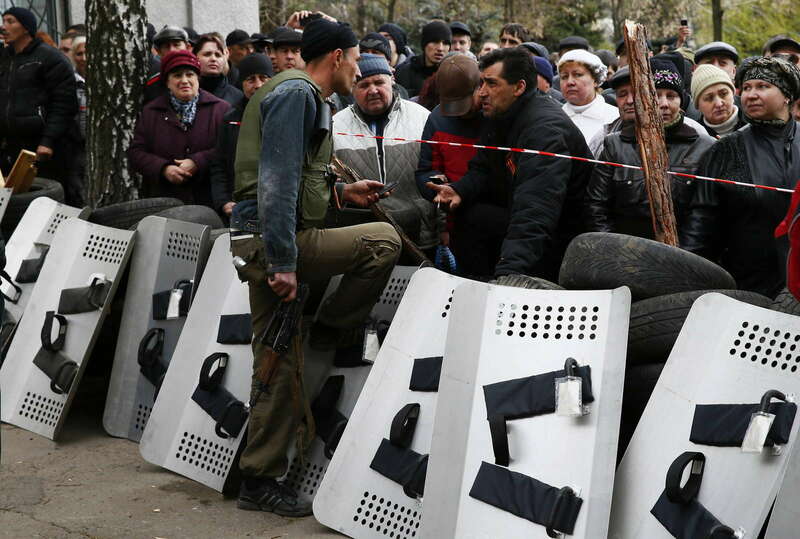 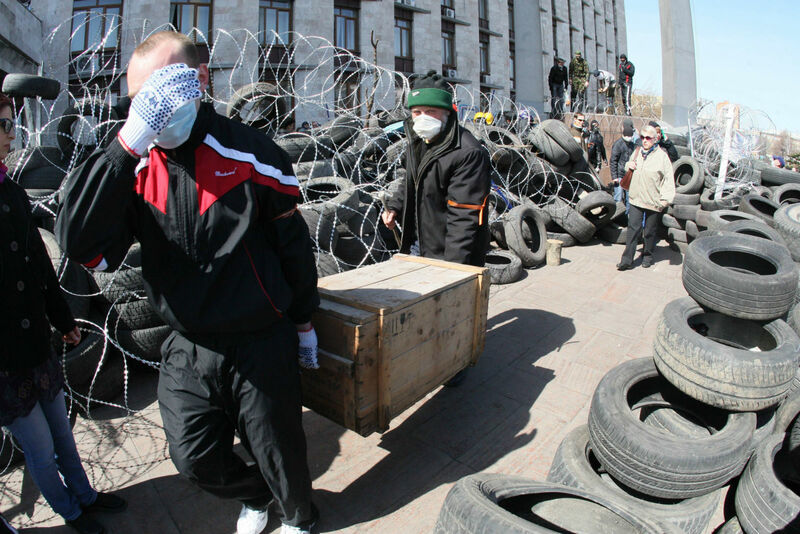 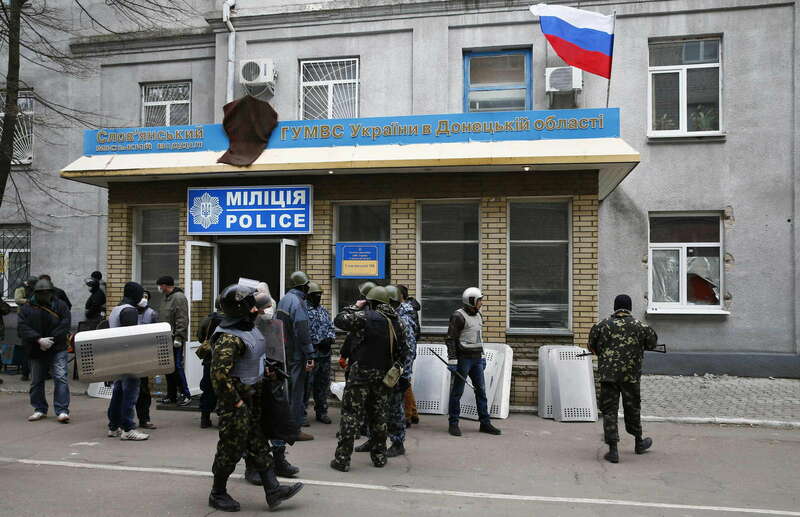 Armed men stand in front of the police headquarters building in Slaviansk, April 12, 2014. 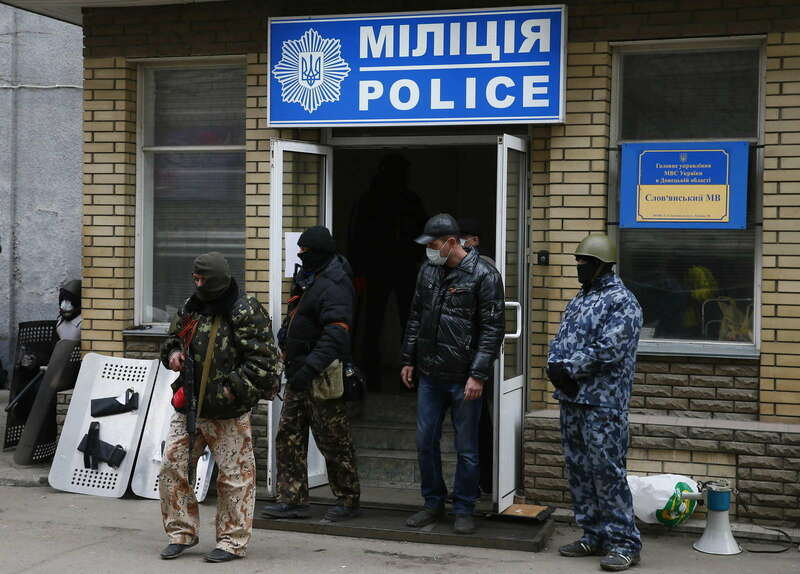 At least 15 armed men seized the police headquarters in the eastern Ukrainian city of Slaviansk on Saturday, extending takeovers of public building by pro-Russian militants who have been demanding autonomy from Kiev. 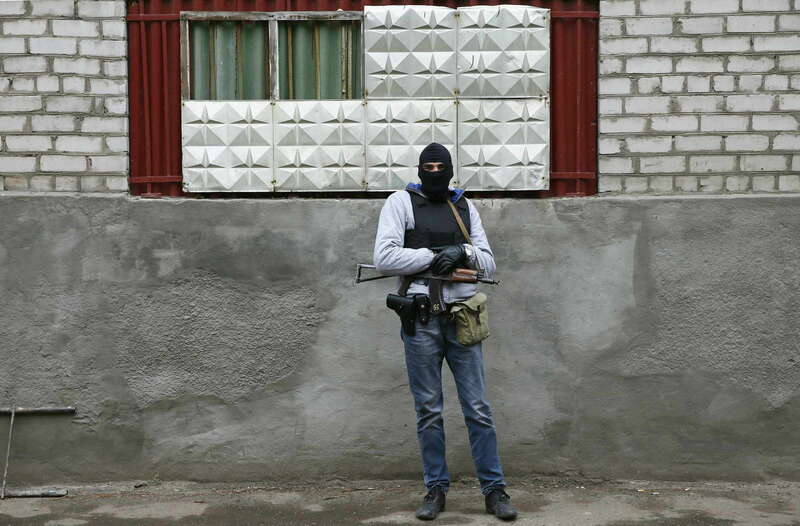 An armed man stands in front of the police headquarters building in Slaviansk, April 12, 2014. 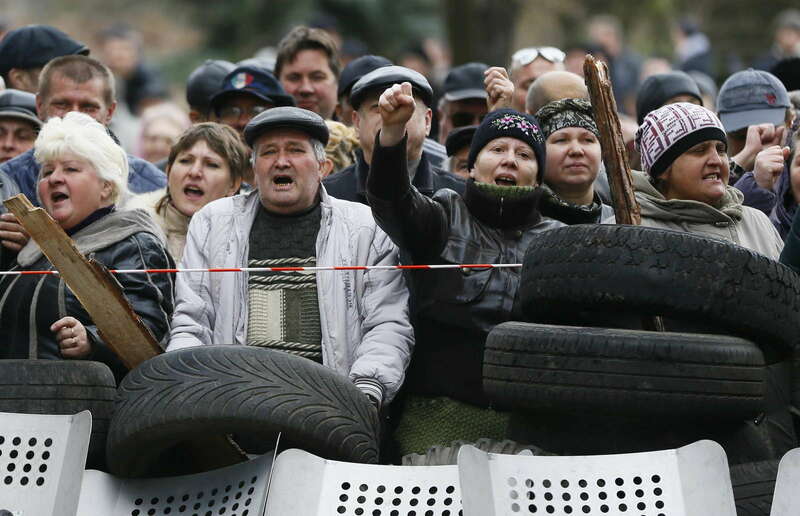 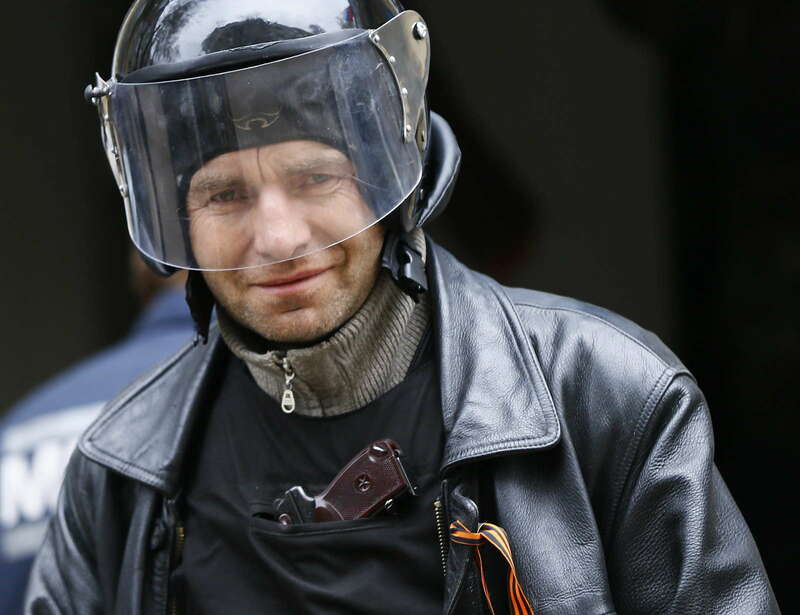 An armed man stands in front of Pro-Russian protesters near the police headquarters. 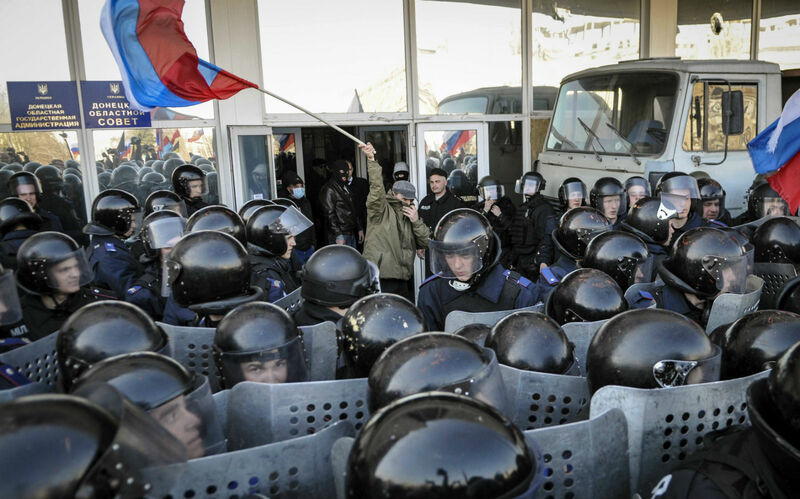 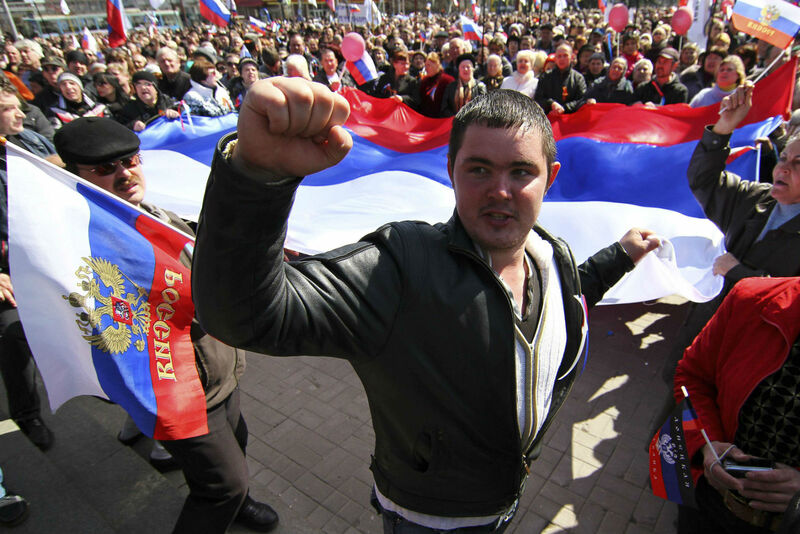 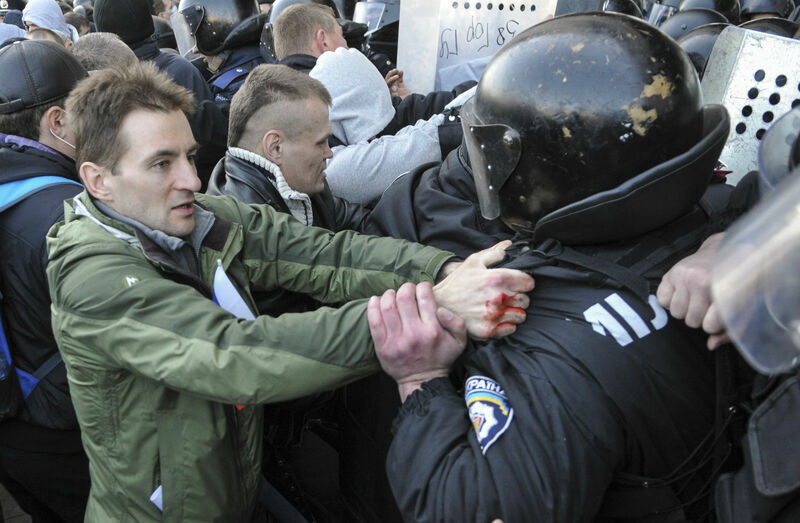 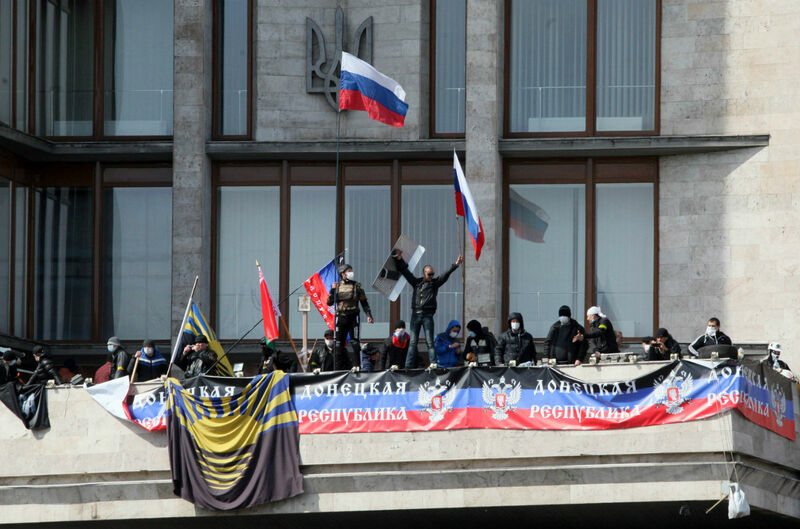 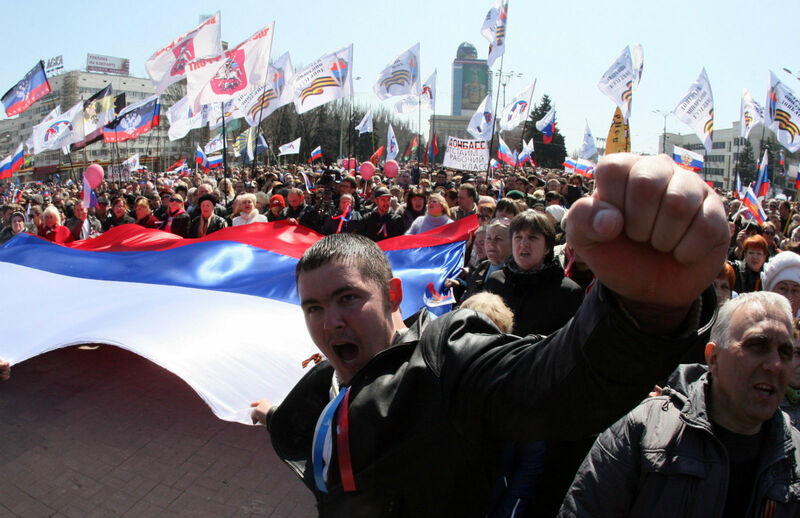 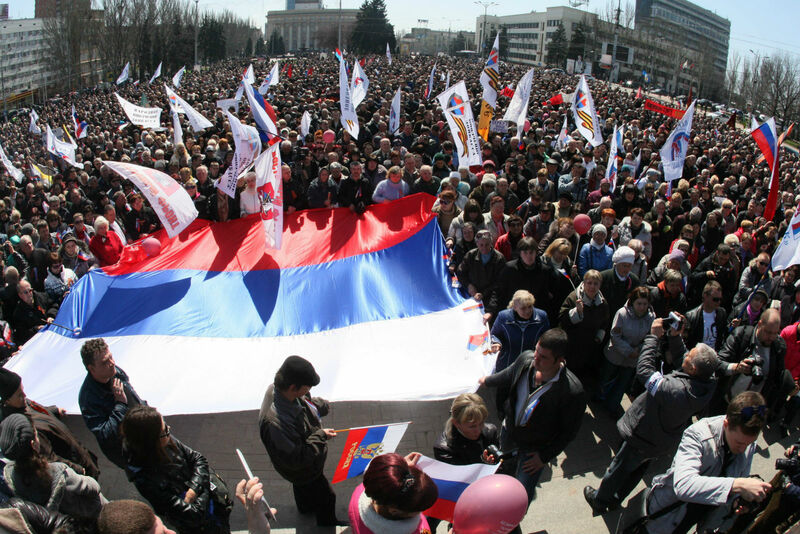 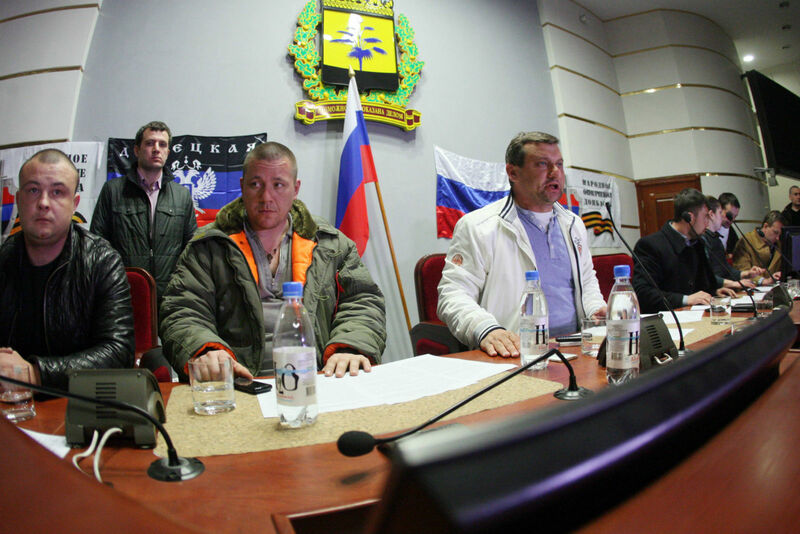 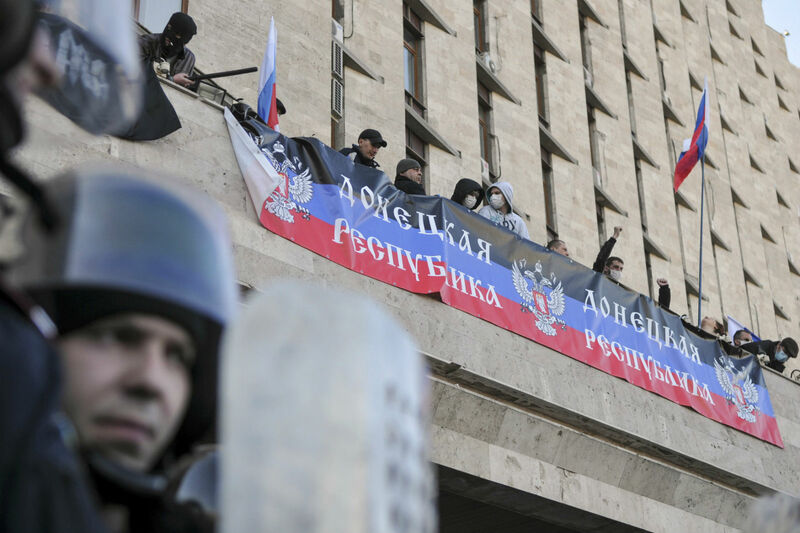 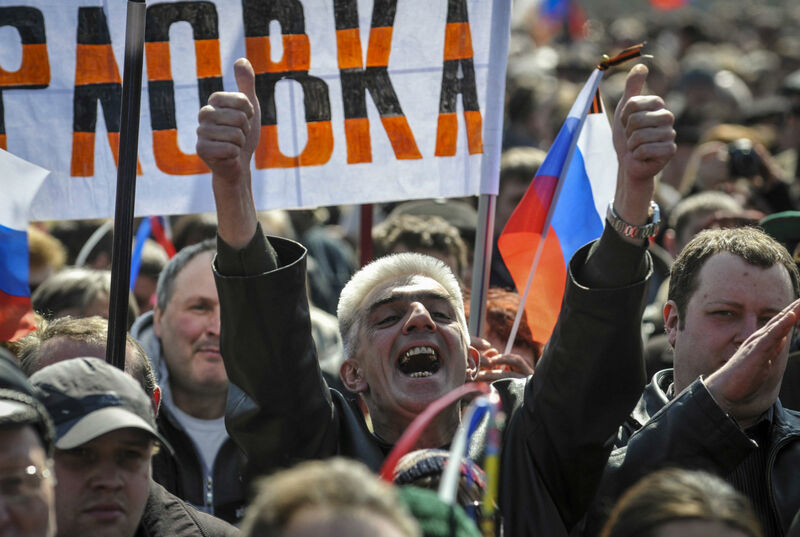 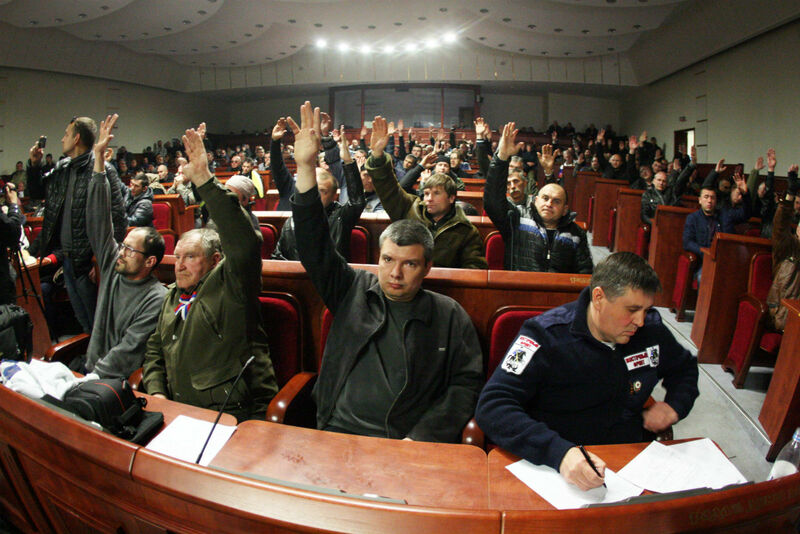 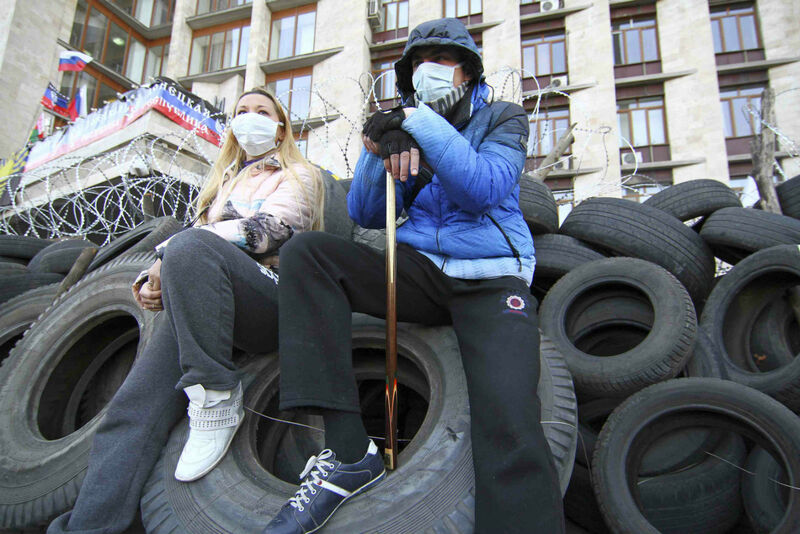 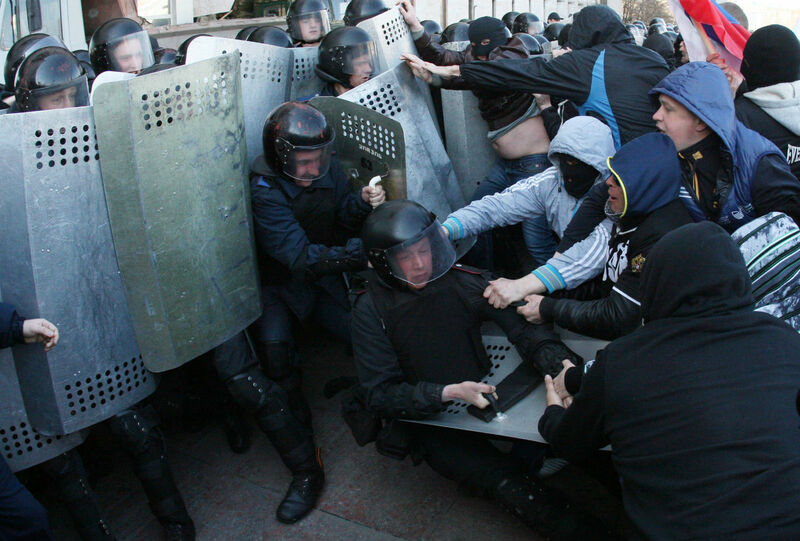 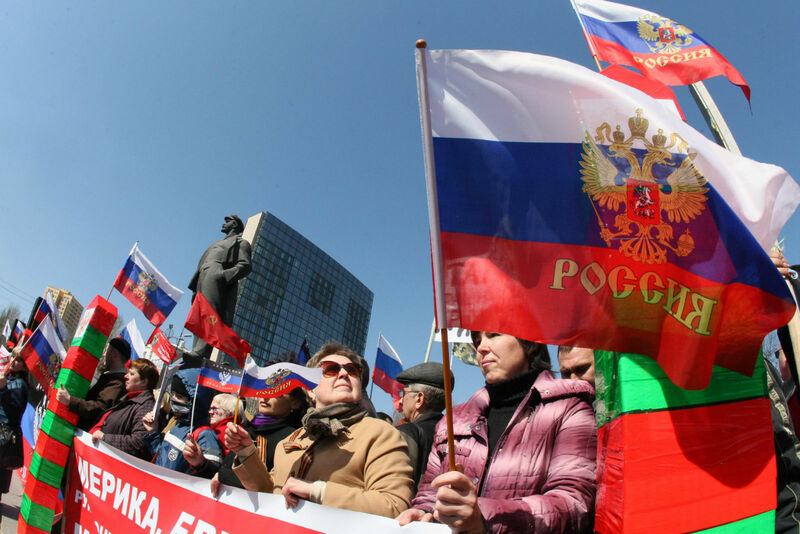 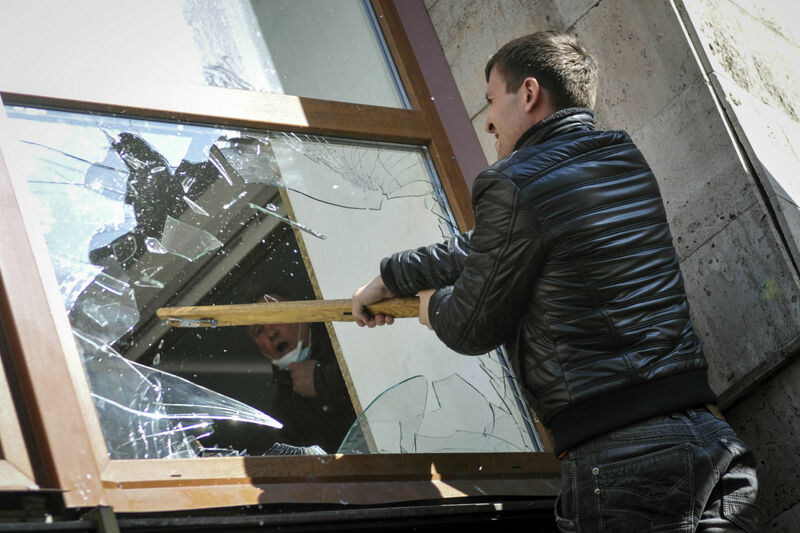 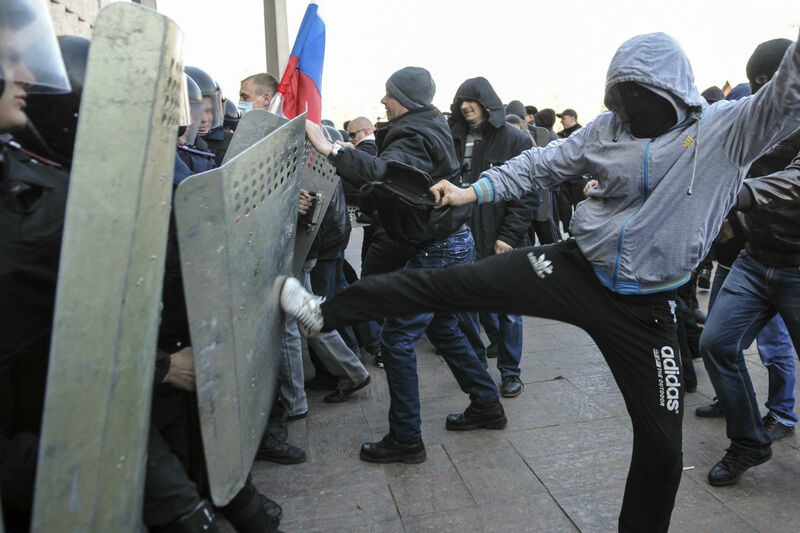 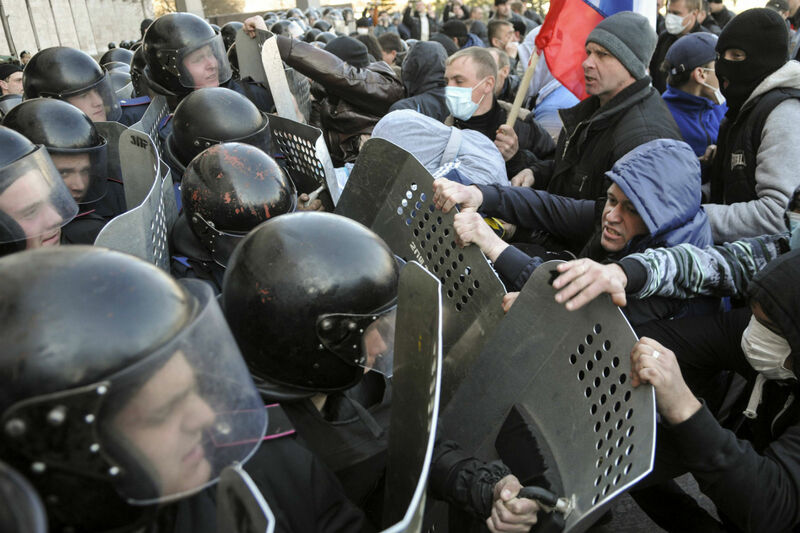 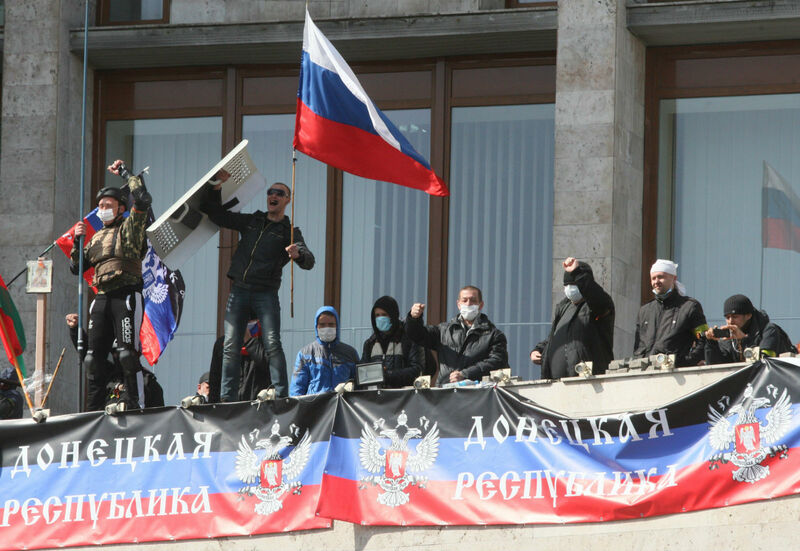 The coordinated attacks and a subsequent raid by a few hundred pro-Russian protesters on the police headquarters of the local capital Donetsk underscored the volatility of the crisis. 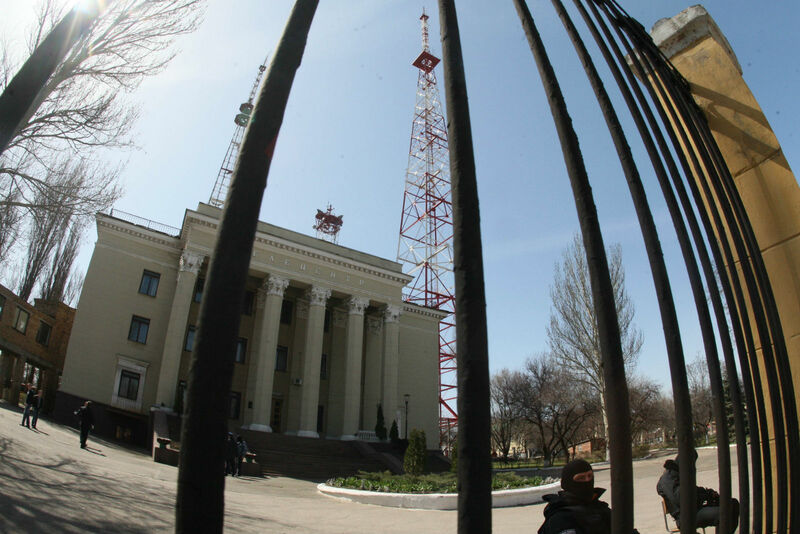 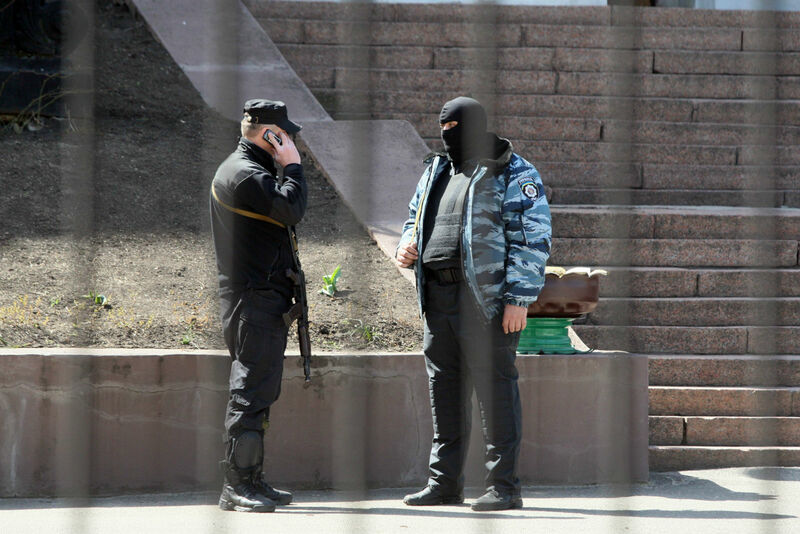 The morning police station raid and a subsequent attack of the regional security service centre happened in Slavyansk - a riverside town of 100,000 about 60 kilometres (35 miles) north of the regional capital Donetsk. 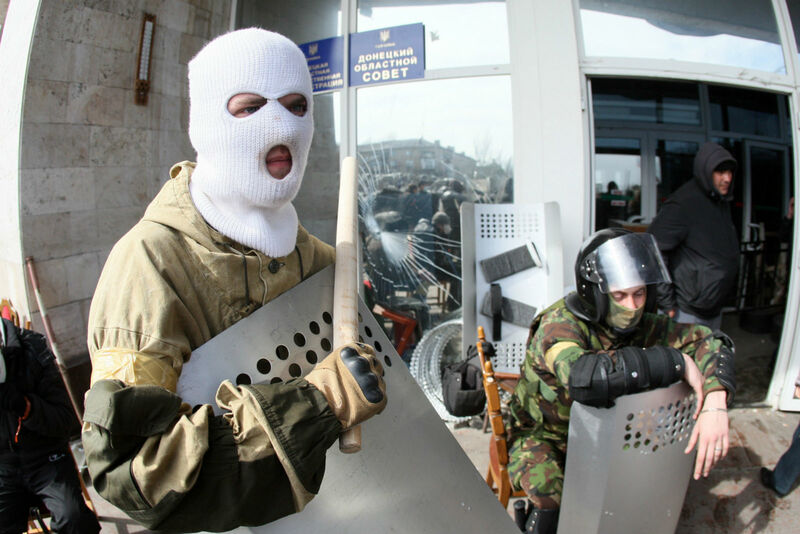 Ukraine's interior ministry said the first assault was led by 20 "armed men in camouflage fatigues" whose main purpose was to seize 20 machine guns and 400 Makarov guns stored in the police headquarters "and to distribute them to protesters". 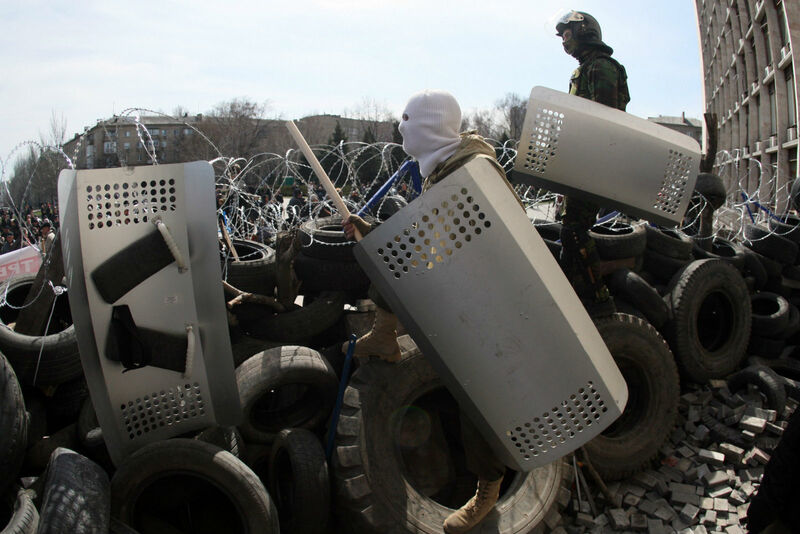 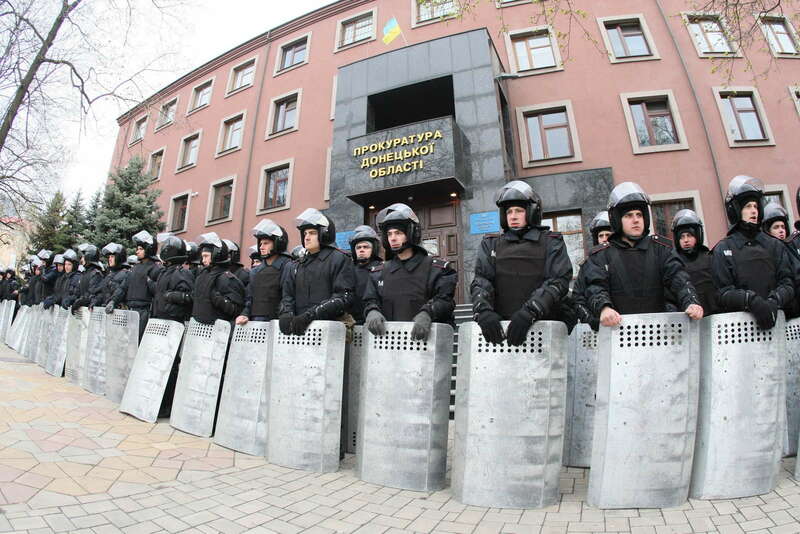 Policemen guard a regional Ukrainian procecutor's office in the eastern Ukrainian city of Donetsk on April 12, 2014. 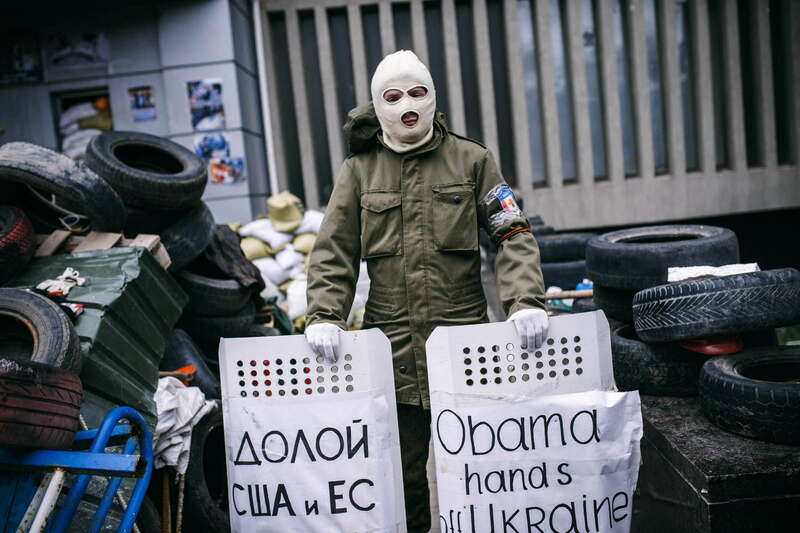 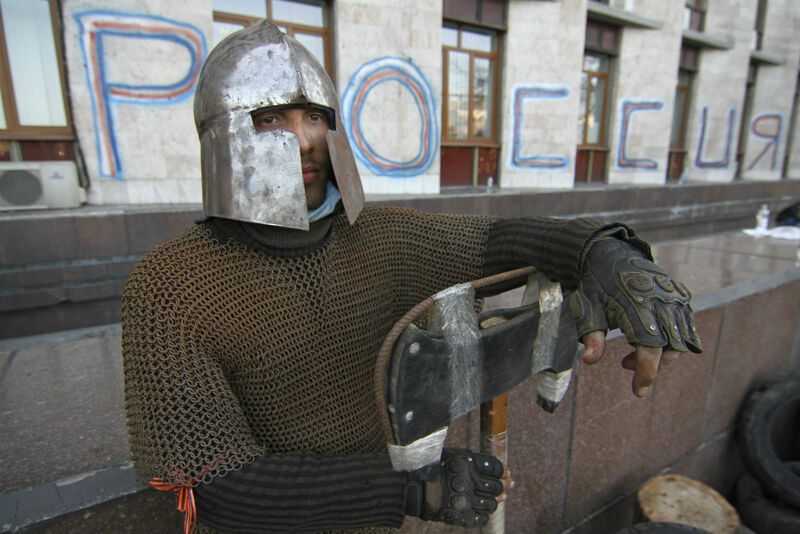 A masked Pro-Russia supporter stands guard outside the headquarters of Ukraine's security agency building in the eastern Ukrainian city of Lugansk on April 12, 2014. 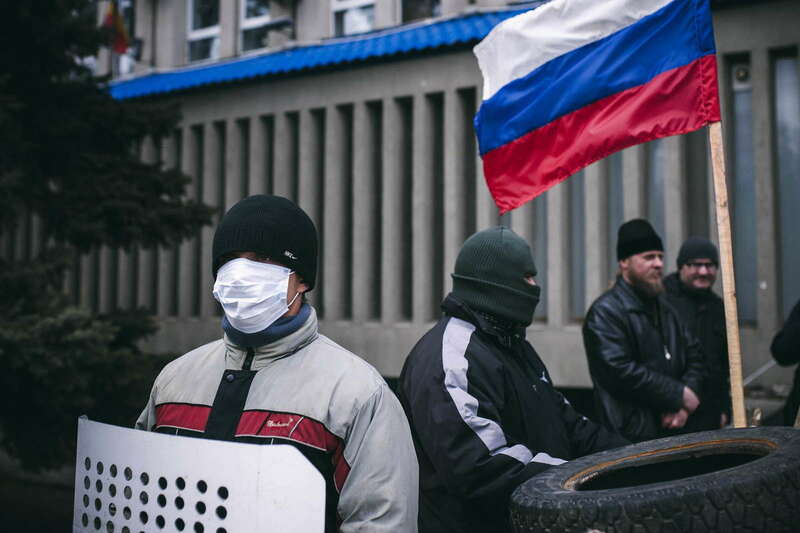 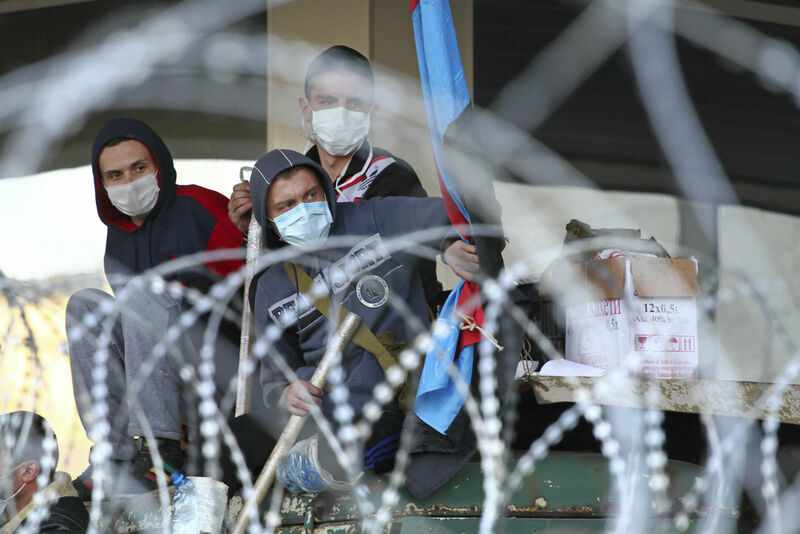 Masked Pro-Russia supporters stand guard near a Russian flag outside the headquarters of Ukraine's security agency building in the eastern Ukrainian city of Lugansk on April 12, 2014.